Editor's note: this review was written by HEXUS forum member Iain Metcalf (a.k.a. Ferral) and reflects his opinion on Gigabyte's high-definition streaming device, the SkyVision WS100. New design ideas and products arrive frequently in the PC industry, and with some of them you do start to wonder if there's any need for such devices; it can feel like companies are milking us for every penny we have with their latest must-have peripherals! Occasionally, though, a new line of devices come along and fit nicely into a market that is getting bigger all the time. Today we are going to look at one of these new devices, a gadget that is ideal for a home user but also anyone that is on the move and needs quick HDMI setup. 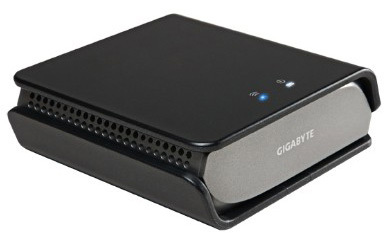 The Gigabyte SkyVision WS100 is one of the latest WHDI (Wireless Home Digital Interface) devices to hit the market, and it is very similar to the Edimax WD-1000TR device in terms of functionality. Why didn’t someone think of these earlier? PCs and other devices like Blu-ray players and games consoles with HDMI output have become a central point in most homes, so a wireless HDMI transmitter makes a lot of sense. So what exactly is the Gigabyte SkyVision WS100 I hear you asking now that I have piqued your interest?! Simply put, it removes the need for HDMI cables. If you are anything like me, behind your TV will be looking like spaghetti junction with all the wiring. Everything is tangled up even though you use cable tidies and zip strips to try and hide all the wires out the way! You may also have a PC sat in the corner of your front room; leaving a trail of cables along flooring and tucked into to your skirting boards. All this just so you can play your media on your big screen! Throw in the current consoles from Microsoft and Sony, a standalone Blu-ray Player with home-cinema speakers and a Sky, Virgin or Freeview HD Box and the fun really starts as you will most likely have run out of HDMI ports on your TV. Now you have to start messing with switch boxes and multi-input boxes to get everything connected. 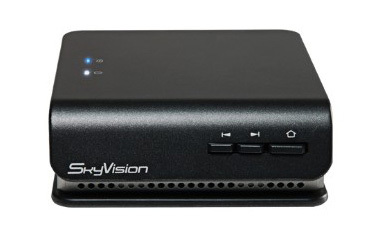 The SkyVision kit from Gigabyte can remove the need for multiple HDMI ports on your TV. 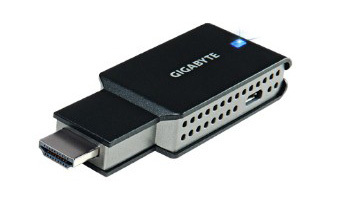 It is a multi-purpose device and can be used on games consoles, laptops, desktop PCs and any other device that has HDMI output and a USB port (required for power). Setup itself could not be simpler - it is literally plug and play in every sense! I personally did not even have to look at the manual or disc that came with it as it is self-explanatory and the connections will only fit where they are supposed to. I connected the transmitter to my graphics card's HDMI out then attached the power USB lead, after this first step I connected a power cable to the receiver and attached it to my TV using the HDMI lead that Gigabyte supplies in the box. Within a few seconds it had automatically paired up and was ready to use and I could see my desktop on my big screen. The transmitter does have a pairing button on the adapter, however for just one device you need not worry about it, you only need the pairing button if you are using more than one transmitter. The SkyVision receiver can have multiple connections from the wireless transmitters, though of course you will have to purchase extra transmitters to do this as just the one is supplied with the initial kit. I have not yet managed to source any extra transmitters from my usual preferred parts suppliers. However, come the official UK release we will no doubt see an abundance of them from various suppliers online or in your local stores. Once you have managed to purchase a few extra transmitters the receiver has an on-screen display allowing you to pair and name the additional devices and select which one you currently want to be seeing on your TV. Unfortunately, and unlike some of the other similar devices on the market, there is no remote control for the SkyVision which is a little disappointing - it means having to get up and change the input via the buttons on the front of the receiver whenever you want to switch between devices. As I mentioned earlier the possibilities for this device are endless, whether you are a home or business user. I have tested this on my PC, PS3 & Blu-ray player with success every time and have encountered no messing about trying to set it up. I have played movies in 1080p from my standalone Blu-ray player with home cinema and the device worked flawlessly. On the PS3, I was gaming and watching Netflix and once again no issues whatsoever setting up or with performance. I also have my PC setup on the opposite side of the room to my TV so this gave me a chance to test the streaming and wireless capability at a distance of approximately five metres. I used the PC to stream media as well as some 1080p (1,920x1,080) gaming and the only thing I had to do was change the PC's sound properties so that the default device was my Samsung TV. I did find, however, that after using the device for a few days Windows 7 now recognises when I plug the transmitter in and automatically changes the default sound device to my TV which makes life even easier!